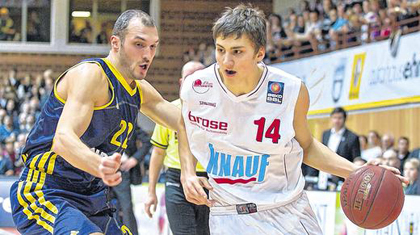 s.Oliver Baskets power forward Maximilian Kleber has been in the headlines of late for putting his name into the 2012 NBA Draft as an early entry. That’s reason enough for heinnews’ David Hein to travel to Würzburg to catch the team’s first round playoff game against Alba Berlin. Kleber only played 2:30 minutes and missed his only shot as s.Oliver Baskets eliminated Alba with a 3-1 series win. Hein and the Würzburg native Kleber talked afterwards about the meaning of the victory for the city and club; his ears hurting; gaining some attention; pulling his name out of the NBA Draft; and what he needs to work on in his game. heinnews: Hi Maxi, you are from Würzburg, what does this victory and reaching the semifinals of the Beko BBL playoffs mean to you, the club and the city? Kleber: Quite a lot. Something like this hasn’t happened in a long time. You have to remember that we were in the (fourth division) Regionalliga four years ago. So that we advanced is incredible. heinnews: If someone would have said before the season that a promoted club from the state of Bavaria would knock Alba Berlin out of the first round of the playoffs, not many people would have thought about s.Oliver Baskets but more Bayern Munich. How was the club able to make such a big step forward so quickly? Kleber: Definitely through great play. At the moment we have in (John) Little a great scorer. But we all fit well together and that is our strength. We also play tough defense and that’s how we beat Alba Berlin. heinnews: What is it like for your from this city to play in front of this crowd in this arena, which has been sold out for years? Kleber: It’s incredible. My ears were really hurting today because it was so loud. But it was loads of fun. heinnews: Your next opponent in the semis will be ratiopharm ulm, who played an unbelievable season as well. What are your thoughts on them? Kleber: We know that Ulm is very strong. They swept New Yorker Phantoms Braunschweig 3-0 out of the playoffs. I think we have a chance. But we have to see how things go, especially on the road. heinnews: You have been in the news quite a bit lately by putting your name as an early entry into the 2012 NBA Draft. How did that process come about? Kleber: It was an idea from my father and my agent. My problem was that I was injured a long time and no one really knew me. And this will bring some more attention and possibilities for me. So that’s why we decided to enter my name in the draft. heinnews: Do you intend at all to keep your name in the draft or will you pull it out before the draft? Kleber: I will very likely pull my name out because the probability that I would get drafted this year is much too low. heinnews: And what are your thoughts about the whole process? Kleber: I just hope that I have a chance of getting drafted in the next one or two years. heinnews: Now that you are healthy again, how do you want to approach things? 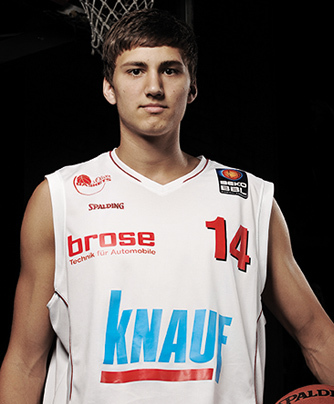 Kleber: I will be playing this summer with the German U20 national team. And I just want to continue to improve and get as much playing time as I can, which I missed the last two seasons. heinnews: Of course young players say they have so much to work on, but where do you see you need to work on your game the most? Kleber: On my post work. Both offensively and defensively. heinnews: You have gained some muscle over the past year but how do you feel your body can hold up in this league playing against power forwards and sometimes centers like Derrick Allen and Torin Francis from Alba tonight? Kleber: I can tell that I need to add a bit of weight but it has also gotten better this season. But you need more to defend those guys. heinnews: Talk about your plans for the summer. You mentioned the national team. What are your thoughts about the U20 national team, which will play the European Championship this summer in Slovenia after reaching fifth place in 2011? Kleber: We have to wait a little bit. We can’t really say too much ahead of time. But we definitely have a very strong squad and I think we have a good chance of really advancing pretty far.